Save for a handful of teams, most backfield situations are in a constant state of flux when it comes to making fantasy football lineup decisions and waiver claims. Entering Week 5, the workload distribution for running backs across the league is coming into clearer focus. The goal for this weekly piece is to arm you with the key PFF data points to be able to earmark which RBs are trending up, and which are trending down. Before we dig into Week 5, let’s take a quick look at how things played out for the running backs we broke down last week. Notes: Fantasy owners are understandably frustrated by Kerryon Johnson’s workload, but reading between the lines, it’s certainly plausible the Lions are planning to ramp up his work as the season moves on. This week, Lions coach Matt Patricia has talked about studying running backs who wear down late in the season, while offensive coordinator Jim Bob Cooter wants to keep “strategic information” about RB workload in house. … Aaron Jones led the Packers’ backfield in snaps and touches, and that trend should only continue. … Along with a slew of injuries on the offensive side of the ball, the 49ers’ red-zone TD rate (37.5%) ranks just 30th in the league. Not much room for fantasy success there. … Ito Smith is eating into the Falcons’ backfield touches, and that could only complicate matters when Devonta Freeman returns. James White owners need not panic, as White went out for a pass route on 29 of his 40 snaps and remains a key part of what the Patriots want to do on offense. White also doesn’t need heavy volume to impact the game, as evidenced by his eighth-best average of 0.65 fantasy points per opportunity. However, Michel has improved his PFF rushing grade each week, and subsequently he’s seen his snaps and touches rise each week. Considering Michel ran just three pass routes against Miami, he’ll need 15-plus weekly carries plus goal-line work to hang around as a fantasy RB2. So far, Michel’s gotten two carries inside the 5 and did not score on either of them. 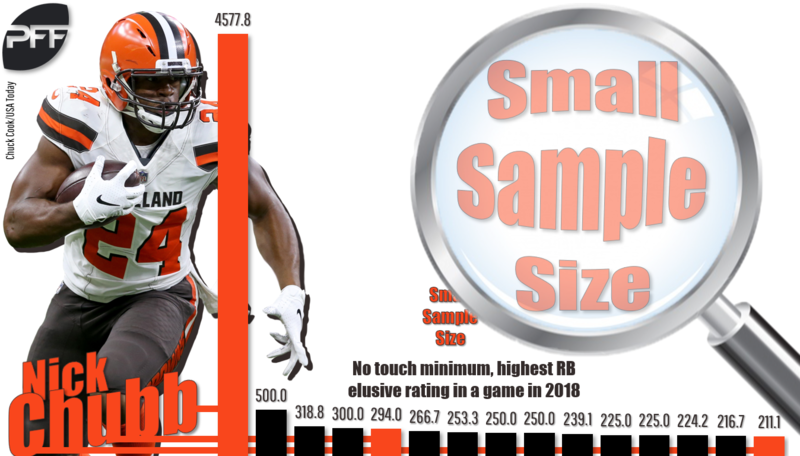 Even Hue Jackson acknowledged this week that Chubb has to get more touches. The rookie has played a grand total of 15 snaps this season, but he’s parlayed 10 carries into 146 yards and two touchdowns and essentially broke our elusive rating against Oakland (4,577.8 on a stat where 100 is usually very good). A small sample size, yes, but Chubb also put up Herschel Walker numbers at Georgia. Playing in the always tough SEC, he posted a top-five elusive rating in this year’s draft class and averaged 3.8 yards after contact. And yes, Carlos Hyde is a top-10 PPR back after four games while leading the league with 83 carries. However, Hyde is producing only 3.4 YPC, and his fantasy scoring is buoyed by five touchdowns, all of which came within five yards of the end zone. That’s now four straight weeks with a dip in production and volume for Kenyan Drake. We’ve previously broken down Drake trending down in this space, and a lot of that has to do with game flow. Incredibly, the Dolphins have ran only 40 offensive plays over their last two games. Even the Alvin Kamaras of the world would have a tough time maintaining fantasy success in that limited amount of opportunity. Still, Gore did play three more snaps than Drake last week, even in a negative game script. Given his history in this league and continued comments by Dolphins coaches about wanting to keep him involved, Gore is worth a look. Just know that he is a touchdown-dependent back who doesn’t create much on his own; Gore has not slipped a tackler on any of his rushes since the opener. Frustrated Jordan Howard owners, before you go and bench him for Cohen, recall that Cohen was eighth in PPR scoring after three weeks last season. The rest of the way, he was 48th. The big variable, of course, is first-year head coach Matt Nagy. Still, we can’t ignore the impact Cohen had in the Bears’ impressive win over Tampa Bay, as he produced career-highs in rushes (13), touches (20), and scrimmage yards (174). Despite Howard’s improvements as a receiver, defenses have been able to key on him in the early going. While Howard is averaging just 3.2 YPC, he’s being contacted after just 0.44 yards. That’s tough on anybody, and so Nagy made it a priority last Thursday to get Cohen the ball in space. As a result, Cohen is now seeing a healthy average of 2.9 yards before contact on the season. Somewhat quietly, Hines is currently 15th in PPR scoring this season despite only 18 carries. That’s because he’s been one of the most effective pass-catching backs to this point, hauling in 22-of-25 targets for 119 yards and two scores. Heck, as a receiver alone, he has more PPR points than guys like Demaryius Thomas and Sammy Watkins. Given a golden opportunity in the season’s early going, fellow rookie Jordan Wilkins has been unable to separate himself. Of course, starter Marlon Mack has been sidelined by a lingering hamstring injury for the better part of two months. While the bottom-line rushing numbers leave much to be desired, Indianapolis does own PFF’s 14th-best run grade and 10th-best blocking grade. Given an opportunity to cement himself as Tampa Bay’s lead back early in the season, Barber has failed to capitalize. Averaging a mere 3.0 YPC with only two catches on four targets, Barber has watched his number of carries drop each week, from 19 to 16 to eight to seven. Since Week 2, Barber sports the fifth-worst elusive rating out of 55 qualifiers, with a missed tackle rate of only 6.1% and an average of 1.94 yards after contact. Of course, Ronald Jones had a dreadful preseason and was a healthy scratch for each of the first three games. And it’s not that the second-round rookie did anything particularly memorable in his debut this past week, but he did out-touch Barber on 11 fewer snaps. At one point last week, it looked like Matt Breida was iffy at best to suit up, given his comments about it being a long season and needing to feel comfortable with his knee injury. Of course, Breida went on to play a season-high 38 snaps against the Chargers, while Morris has seen his snap count dip each week. On three fewer carries this season, Breida has just about lapped Morris in yardage (313-167) and has 11 runs of 10-plus yards, compared to only three such runs for Morris. Frankly, George Kittle might be the only worthwhile fantasy show in town these days for the 49ers banged-up offense. But at least in PPR formats, negative gamescripts bode well for Breida to rack up catches out of the backfield. All things considered, the one-dimensional Morris is relegated to a touchdown-dependent dart throw as a bye-week fill-in for desperate owners. This won’t be a popular take, considering Lindsay has seen 12 or more carries in three of Denver’s four games and is averaging a robust 5.9 YPC with a couple of touchdowns. However, Lindsay also failed to evade any tacklers in his 14 touches this past week. In fact, he’s slipped just one tackle over the last two games and has averaged 1.81 yards after contact in that span, which ranks 44th out of 49 backs. In other words, he’s been getting what’s blocked, as evidenced by his 2.8 yards before contact on the season. In that same span, Royce Freeman has forced eight missed tackles on 21 rushes and is getting 4.8 yards after contact, which ranks second behind Aaron Jones. Freeman has been given only 1.4 yards before contact on average, and he also ranks third in the league with 10 rushes of 10-plus yards. The pendulum is starting to swing. Since returning from suspension in Week 3, no back has been tougher to bring down than Aaron Jones, who is averaging 3.5 yards after contact with 10 missed tackles forced on 19 touches. It was also Jones, and not Williams, who started the second half for the Packers this past Sunday. Meanwhile, Williams ranks dead-last in elusive rating on the season, as he’s the only one out of 60 RBs who has yet to force a missed tackle. It’s actually quite the feat. Not since 2015 has a qualified RB gone this deep into the season without evading a tackler. Heck, this time last year, even Paul Perkins had slipped a few tackles. Still, he’ll continue to see the field as long as he continues to be Green Bay’s best pass-blocking back, which is kind of a big deal considering Aaron Rodgers is already banged up. Every year, we warn folks about trusting Pete Carroll. Still, every week I get asked about one Seahawks RB or another. Folks, the last time Seattle had a fantasy back finish in the top-35 was Marshawn Lynch in 2014. This year, it’s been a particularly exhaustive game of cat and mouse. Carson played one more snap than Rashaad Penny in the season opener, and then Penny held a one-snap edge the following week. In Week 3, Carson dominated the snaps, only for Mike Davis to emerge out of nowhere as the workhorse in Week 4. Ultimately, Seattle owns our fourth-worst run-blocking grade on the season, and the back they invested a first-round pick on has not broken a tackle on his last 22 carries. Like my parents used to tell me about drugs and bad crowds, just stay away.